The Johari Window is a psychological model for effective group development and self-awareness, and plants its roots in the human behavioural phenomenon. Failing to manage group development can result in ineffective group communication, and hence be the source of various downfalls of a project, streaming from prevention of information sharing to decreased performance and unproductiveness. In order to prevent these circumstances, the Johari Window will be discussed as a means to embrace self-awareness, enable dynamics, increase communication and create effective group development and draws upon psychological and managerial theories to enrich the model. This article will start out with outlining the background history and purpose of the Johari Window, and give a thoroughly elaboration and description of the four quadrants. Additionally, the Shannon-Weaver model of communication and Tuckman's stages of group development will briefly be touched upon sideways with the importance of feedback to stress the necessity of managing group development, and simultaneously create a link between the models. Later in this article the application of the Johari Model will be discussed in which the theoretical way to apply the model will be highlighted following two cases in two different setting where the Johari Window is applied, and finally limitations and benefits will be outlined. The Johari was propounded by American psychologists Joseph Luft (1916-2014) and Harrington Ingham (1916-1995) in 1955  from whom the name JoHari was derived combining both of the psychologists names. It was initially developed as a game in Joseph and Harrington's group training program, but was later expanded beyond borders. Today Johari Window plays a significant role to enhance the development of soft skills i.e. self-awareness, empathy, cooperation, inter-group relations, and personal development . It mainly works as a psychological tool, but is also used as e.g. a communication tool to demolish communication barriers and increase effective feedback, inter-group development- and intra-group development tool and as a strategic tool. Furthermore, the Johari Window can be used in various settings streaming from training programs e.g. training of military personnel and creativity workshops to organizational challenges e.g. Group Development and feedback sessions. Nevertheless, it is a tool with many capabilities. The Johari Window's purpose is widespread i.e. it can act in different contexts. However, significant purposes are the creation of an effective group development process and to enhance group communication doing so with solely four quadrants. The Johari window contains four quadrants, see Figure 1, the open/free area, blind area, hidden area and the unknown area, each with similar sizes that can further be changed based on the particular group member. The quadrants make up the window and is the foundation of the model. When a group is developed the open/free area is small due to the lack of shared knowledge, however as the development evolves the open/free area maximizes due to shared awareness taking place. This is particularly seen when new group members enter an already established group. This quadrant contains e.g. the behaviour, feelings, emotions, experience, skills, knowledge that is known by the individual group member and the other group members. Furthermore, it is the quadrant where group communication, collaboration, cooperation, individual effectiveness and individual productivity mostly takes place and mistrust, miscommunication, conflicts and confusion are downsized or barely existing. In the blind area the information about oneself is unknown but known to the rest of the group. This area is often referred to as the bad breath describing how other feel the smell but the individual does not . It is tainted with unproductiveness and decreased effectiveness. The initial jump from this area is to reduce it and increase the open/free area. Furthermore, some group members can purposely withhold information and hence continuing the group development with individuals lacking information and consequently decreased motivation. This area represents an individual’s private information that is hidden from the rest of the group. This is e.g. fears, secrets, bad motives and work related information. That is not to say that all private and personal information should be exposed, it is thus the project manager’s role to steer a project group towards revealing information according to relevance and necessity. The aim in this area is to reduce the hidden area and hence demolish e.g. ineffective group communication, confusion and misunderstanding and increase the open/free area through moving relevant information into it to increase a mutual understanding. An ability that is under-estimated due to the lack of opportunity, encouragement, confidence or training. A natural ability or skill that an individual does not realise they possess. A fear or subconscious feelings that an individual does not know they have. A conditioned behaviour or attitudes from an individual’s childhood. Described previously, the Johari Window can be used in group development when individuals become part of one unity. Each individual is different thus to unite a group can be both time consuming, and if not managed correctly, it can lead to decreased effectiveness and efficiency. The Johari Window explains the necessity to enlarge the open/free area and hence create a smoother group development process. In order to explore what happens when individuals become a unity, psychologist Bruce Tuckman developed the five stages of group development, see Figure 2, and is perceived as being inevitable for every group to undergo regardless of the pace and particular environment. The first stage appears when a group is newly formed in which it can consist of positivity and politeness  and/or distant and uncertainty as individuals are being introduced to each other. As uncertainty can set in the Johari Window can play an important role to gather the individuals, enable shared knowledge, create clear objectives and task responsibilities. When a group has overcome the forming stage, it moves into the storming stage where individuals start to push against the boundaries created in the previous stage. The storming stage is typically caused by the difference in working styles, resistance to change, conflicts, overwhelming and stress . Nevertheless, this stage is the most critical one, and can be termed the win or break stage. It is important for the project manager to resolve any storming factor to successfully move to the next stage. The Johari Window can work as a means to tear down individual walls towards the rest of the group members, and ease up the atmosphere through e.g. revealing what might be hidden and simultaneously communicate differences. The third stage appears gradually as group members starts to form common norms, bypassing differences and provides constructive feedback to each other. This stage is marked by a stronger commitment, productivity, and respect to one another . However, re-laps to the storming stage are not prohibited and can occur at any given time during this stage, thus it is necessary to continue bonding, giving feedback and communicating. This stage can be seen as the open/free area in the Johari Window, but as described earlier the area can shrink which is what happens when a re-laps occurs. During this stage effectiveness and efficiency are increased and the common shared goal is worked towards with the support and commitment from each group member. Productivity is at its peak and results are visual. Referring to the Johari Window, the open/free area is large and communication, trust, and information sharing takes place at a great level. The Adjourning stage was later added as a final stage to the process . It initiates that eventually a group will detach e.g. project teams, which can cause uncertainty and be difficult to individuals who already have formed strong bonds with each other. This stage can be inevitable and is natural to undergo to join a new group and hence start the process again. Communication is an inevitable factor of effective group development, it is said that to manage is to communicate, and by communicating you manage, hence not only does miscommunication affect the information flow, but it can also hinder project goals. The Johari Window touch upon the understanding of each group member’s way of communicating and how information is transferred from the sender to the receiver. 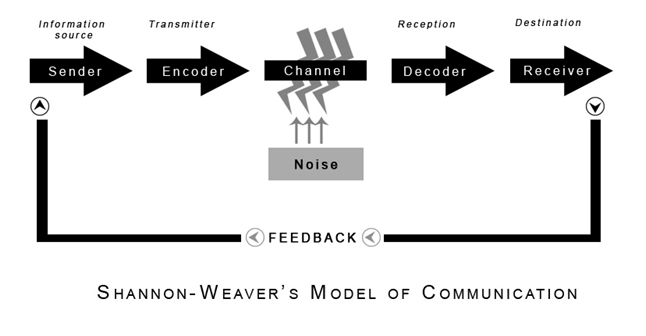 The Shannon-Weaver model of communication' , see Figure 3, describes the process from the sender to the receiver. The Sender is the information source that creates the message, chooses the channel and sends the message, to the encoder. The Channel it is the medium that is used to send the message and is where noise can float in and intervene with the message being transferred. In other words, if noise intervenes it can be looked at as the bottleneck of an effective communication process and hence miscommunication can occur. The Decoder is the reception i.e. the binary data is converted into a message . The Receiver is reached when the message arrives, and in turn provides feedback according to the message. Linking this to the Johari Window, the model of communication can act as a tool to increase the flow of giving and receiving information in a group. As an essential part of both models, feedback.is perceived as being an important part of effectiveness and personal development. Constructive feedback can contribute to personal learning and realization of personal issues that can further be resolved, and move the individual to the open/free are. The Johari Window have been used in various situations but its core principle of encouraging individuals to open up and move towards the open/free area has remained the same. This section will start out by looking into the theoretical way of applying the model. Later, two cases in two different settings, in which the Johari window has been applied, will be examined. The Johari Window theory implies that an individual’s actions are guided by the mind  and thus the framework i.e. the mind is described to be like a square-shaped window. When groups are developed the core challenge is to expand the size of the open/free area, which can be done horizontally into the blind area through the process of feedback solicitation i.e. actively listening to feedback from the group, and vertically into the hidden area through revealing e.g. information, feelings and concerns to the group, likewise group members can speed up the process by questioning other group members about themselves . In order for a group member to move out of the blind area, it is crucial for a project manager to take part in the feedback and promote non-judgemental feedback, and group response to what is revealed by the individual, to reduce fear . Furthermore, the hidden area can be reduced by creating a shared organisational culture and positive working atmosphere, to limit the fear of judgement and vulnerability. Lastly, the unknown area can be reduced by self/collective/mutual-discovery or observations, to discover e.g. hidden talents. An effective way for a manager to contribute to the discovery of hidden talents, is to enable the opportunity to try new things, with no pressure to succeed . Each area can be given a title, and hence each individual in the group can be given a title according to which area they are in, see Figure 4 i.e. if an individual is in the open/free area the personality title given is an Open person, The Questioner is given in the blind area, The Teller is given in the hidden area and the title The Clam is given in the unknown area. The Johari Window can be looked upon as a game with 56 adjectives, see Table 1, that describes an individual, and can be used as a way to strengthen the group development process. Step: Each group member participating in the game is required to pick five or six adjectives from the grid that describes their own personality. Step: The group members are requested to pick five or six adjectives that describes each of the other group members. Open/free area: This area contains the adjectives that were chosen by the individual group member and the other group members. This represents the adjectives that are known by both parties. Hidden area: This area contains adjectives that were only chosen by the individual group member but not by the other group members. This represents the adjectives that are known by the individual group member but not the other group members, thus the adjectives need to be moved to the open/free area by the individual who then should take use of them. Blind area: This area contains adjectives that are not chosen by the individual but chosen by the rest of the group members. This represents the adjectives that the individual does not know but other know about the individual. The individual can choose to let the group members reveal these additional qualities so that the they can be taken in use. Unknown area: This area contains adjectives that are not chosen by either the individual or by the other group members. This represents the adjectives that were not recognized by anyone who participated. The individual participant should thus create an action plan to develop some of the qualities that is required in e.g. the group development process. However, the Johari window is not solely applicable to effective group development, it can also be applied to various situations and settings as examined in the two following cases. The first case gives an insight into how the Johari Window can be used in a creative setting. The case takes place as part of a training program hosted by two management consultants. The training programs are used by different executives of a large number of companies. The case describes creativity as being a part of the human mind, however individuals does not use the full capability of the human mind i.e. only 2% to 3% are used for creativity. Thus, the training programs are aimed to increase the usage of human capabilities and creativity. This is done through enabling the participants in the program to open up their hidden talents . This process is called the disclosure of the hidden talents to the outside world . Additionally, feedback is brought up as an important factor. Both explicit and implicit feedback from others can convey the ability to identify talents, which beforehand were trapped in the blind area. The participants were asked to transfer the talents from the blind area to the open/free area to start the process of using them. The case highlights the positive affect that the Johari Window has on the participants referring to it as an adrenalin flow, positive stir and tension within the participant’s self. Particularly, the effective use of the Johari Window was an awakening factor for one of the participants, a diploma engineer. The talent was moved from being hidden to revealed and hence moved to the open/free area. The hidden talent was revealed to be singing and the participant took full advantage of it. Additionally, the two management consultants enlarged the open/free area by giving the participant a chance to let the talent become a reality, and simultaneously allowing feedback from the other participants to stream in. The result was that the participant continued with the new discovered talent and developed an entertainment group offering a verity of entertainment programs with the intention to expand further in the future. This proves that the Johari Window can open up for not merely one talent but also embark on future creativity. The second case, uses the Johari window as a strategic tool for optimum client-supplier relationship. The global organisation, MasterCard International started facing challenges regarding correction of the quarterly summaries concerning the credit card results, which in turn is used internally to assess performance and externally to prepare press releases and annual reports . The completeness and correction of the generated data was dissatisfying and a newly implemented quarterly reporting tool was not embraced by members . When analysed what the prospected factors for these downhills could be, the results were e.g. language issues, lack of training, different business models. ACNielsen International Research ended up developing a synergistic approach that combined the strength of the company and could be used in the study on how to resolve these factors. The outcome of the approach was a profound understanding of exactly how the reporting system was administered to members from start to end, how they were constructed and the inter-relationships . The findings were gathered to construct an interview guide to generate data about member’s likes, dislikes, reporting needs and suggestions for improving the quarterly reporting tool to enlarge the knowledge behind why the tool was not embraced by members. Supplier’s ability to build knowledge based on information provided by the client. The aim with the modification was to create an ability to minimize the blind area and the unknown area through the sharing of information i.e. clients, and the construction of knowledge i.e. suppliers. The modification generated results in terms of enhancing the ability to build knowledge that contributed to an overall success. The "open/free area" had come to be known as the Win-Win situation. Summing up, the first case described the Johari Window as a creativity tool in a training program and the second case described it as a strategic tool for optimum client-supplier relationship. Both cases emphasized on the successful outcome that was enabled. The last case also identified that the Johari Window can be modified according to what context it is used in, however the principle remains the same i.e. to enlarge the open/free area. The Johari Window is not inevitable for criticisms nor does it exclude the beneficial aspects. Personal information exposure: The Johari Window does not have a limit of the communication transferred throughout the group, instead it encourages members to communicate what is inside and enhance self-revealing. This can result in further conflicts within the group and prevent an effective group development to take place, as there can be group members who do not want certain information exposed. Individuals are different, with different limitations and perspectives. Certain individuals do not receive feedback in a positive manner, regardless of it being constructive. Thus, the drawback concerning this aspect is the failure to distinguish between individuals and cater to their needs. Cultural differences: It is needless to say that each country aspires its own culture, the world is not made out of a tiny bubble with one unified culture. Thus, some cultures have limitations on what can and should be communicated, and can consequently perceive openness as negative rather than positive. Adaption to external and internal environment: The model enables an ability to adapt to other group members and to different situations and simultaneously be tailored according to the situation. Flexibility: The Johari Window also acquires the strength that it can act on itself or in combination with other models e.g. the Belbin’s team role identification and the Group Development process. Although it does have its limitations and should thus not be applied blindly, the Johari Window is an effective tool to manage Group Development. Individuals are capable of achieving great results, but the right tool(s), the right commitment, and an effective group can achieve outstanding results and as Hellen Keller once said: Alone we can do so little, together we can do so much. ↑ Wikipedia. Johari Window. Retrieved 10 September 2016. ↑ 2.0 2.1 Beganu, N. C. & Nitan, M. M. Armyacademy. The Johari Window: A Model of Feedback and Selfdisclosure in Training. Retrieved 15 September 2016. ↑ Gifford, G. Course & Effect. (2016). Strategic insight of the Johari Window. Retrieved 09 September 2016. ↑ 4.0 4.1 4.2 4.3 4.4 4.5 Chapman, A. Businessballs. (2016). Johari Window. Retrieved 13 September 2016. ↑ Tonnquist, B. & Hørlück, J. (2009). To Manage and Work in Projects. Project Management - a complete guide. Denmark: The author and Hans Reitzels Forlag. 209-212. ↑ Jones, R. G. & George, M. J. (2015). Effective Team Management. Essentials of Contemporary Management. 6th ed. New York: McGraw-Hill Education. 370-371. ↑ 7.0 7.1 7.2 7.3 Mindtools editorial team. Mindtool. (2016). Forming, Storming, Norming, and Performing. Retrieved 12 September 2016. ↑ Tonnquist, B. & Hørlück, J. (2009). Communication. Project Management - a complete guide. Denmark: The author and Hans Reitzels Forlag. 162. ↑ Jones, R. G. & George, M. J. (2015). Communication and Information Technology Management. Essentials of Contemporary Management. 6th ed. New York: McGraw-Hill Education. 430-432. ↑ Hayes, J. (2014). Communicating change. The Theory And Practice Of Change Management. 4th ed. New York: Palgrave Macmillan. 227. ↑ 11.0 11.1 11.2 Mishra, S. Businesstopia. Shannon and Weaver Model Of Communication. (2016). Shannon and Weaver Model Of Communication. Retrieved 12 September 2016. ↑ Tonnquist, B. & Hørlück, J. (2009). To Manage and Work in Projects. Project Management - a complete guide. Denmark: The author and Hans Reitzels Forlag. 213-216. ↑ 13.0 13.1 Prodcons Group. Johari Window. (2011). Johari Window. Retrieved 13 September 2016. ↑ 14.0 14.1 14.2 14.3 14.4 Prodcons Group. Johari Window in Action: Management Case Study 2. (2011). Johari Window case study. Retrieved 14 September 2016. ↑ 15.0 15.1 15.2 15.3 15.4 15.5 15.6 Tullo, J., Desai, S., Rhall, T. Consumer Insight. Blurring the Boundaries: Moving from Market research to consultancy case study. (2004). Blurring the Boundaries: Moving from Market research to consultancy case study. Retrieved 15 September 2016. ↑ Kerpen, D. Inc. (2014). 15 Quotes to Inspire Great Teamwork. Retrieved 15 September 2016. Ref. 4: Chapman, A. Businessballs. (2016). Johari Window. Retrieved 13 September 2016. Annotation: This article gives a profound understanding of the basic theory behind the Johari Window. The author enhances the knowledge by diving into the core factors of the model, starting with a brief background story and leads the reader into a throughout explanation of the four quadrants. Furthermore, the author enriches the article with two examples i.e. The Johari Window new team member and The Johari Window established team member. The article ends with giving an insight into further ideas in which the Johari Window can be used in training, learning and development. Lastly, due to that the information concerning the Johari Window is vastly spread in books, different articles, and webpages, this article collects all the main points and gives a clear overview of the model in one place. Ref. 5,8,12: Tonnquist, B. & Hørlück, J. (2009). Project Management - a complete guide. Denmark: The author and Hans Reitzels Forlag. Annotation: This book gives a quick overview of the Johari Window and combines it with the management of projects. Furthermore, the book also addresses e.g. communication, feedback and group development tools. It is archived from the Project Management course taken place at the University of Southern Denmark, and creates a fundamental understanding of the different tools and theories that a project manager can take great use of and might encounter at the workplace. Ref. 13,14: Prodcons Group. Johari Window. (2011). Johari Window. Retrieved 13 September 2016. Annotation: This website gives a profound insight into the usage of the Johari Window as well as a theoretical overview of the model. The company Podcons Group are head of the site and have management consultants who are trained within the use of the Johari Window. The company writes articles that helps with getting a broader understanding of the model in a group development context, while simultaneously creating a forum in which a case example of the application and results are displayed. Ref. 2: Beganu, N. C. & Nitan, M. M. Armyacademy. The Johari Window: A Model of Feedback and Selfdisclosure in Training. Retrieved 15 September 2016. Annotation: This article gives an insight into the use of the Johari Window with the primary role to act as a feedback mechanism to give and receive feedback. The article is tailored to the training of military personnel, and hence showcases the Johari Window as a flexible model with the ability to be tailored to different settings. The authors give a throughout description of the model and associates the four quadrants with types of training participants. Lastly, the authors touch upon limitations of the model. This page was last modified on 18 December 2018, at 15:10.